Not all of these are cover-to-cover magnifying glass reads, and this is only a small part of my library - however these are currently at the top of the pile. Linq in Action has so far been a brilliant book - and it will be a cover to cover careful read. CLR via C# is a must read for anyone that's been programming in .Net for more than a year or two (I'm thumbing through it for the 2nd time in my spare time). 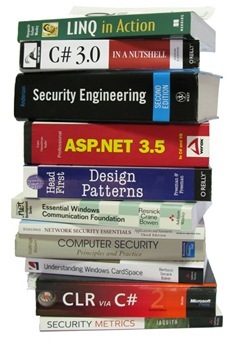 C# 3.0 in a Nutshell has so far proved to be an invaluable desktop reference and Joseph Albahari is a brilliant author. What I particularly like about this book are the examples and gotchas included with every entry; much more than just MSDN in print and much better than an "I feel lucky" Google attempt. With ASP.Net 3.5 I was worried (like a lot of people) that this 1626 page tomb would be just the docs... in printed form; however it is a good combination of reference material and author input. Head First Design Patterns is really a fun read. I've opened other design patterns books, including the famous GoF Design Patterns and various C# flavors - but the format of the Head First series is just fantastic - humorous and educational. The rest are a mixture of things I'm interested in, things I need to read to try and stay ahead of the avalanche, and things I'll need to read for my course. Security Engineering (now in second edition) is a classic for anyone interested in computer security and should really be read in combination with Secrets and Lies from the very famous Bruce Schneier.